Recently, an extremely rare trip by all seven members of the Chinese Communist Party’s most powerful entity, the Politburo Standing Committee, to Shanghai sent plenty of important political signals. The Standing Committee members rarely travel together. Should their lives be endangered, the country might be left without political leadership. On Oct. 31, Chinese leader Xi Jinping, Premier Li Keqiang, along with Li Zhanshu, Wang Yang, Wang Huning, Zhao Leji, and Han Zheng, visited the site where the First National Congress of the Chinese Communist Party (CCP) was held, which was turned into a museum in Shanghai. 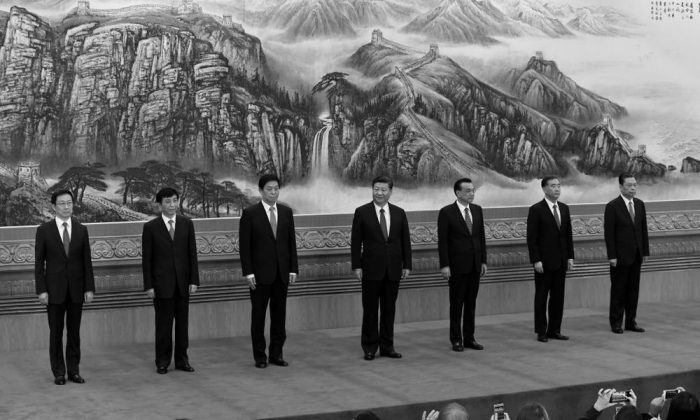 While at the museum, Xi, along with the other six members behind him, raised their right fists to swear an oath of loyalty to the party. Afterwards, the group took a stroll at the South Lake and visited the Nanhu Revolutionary Memorial Hall. The trip was politically significant because of the location, as well as how all seven members traveled together, according to Xia Xiaoqiang, a U.S.-based current affairs commentator. “Xi’s Thoughts, after being written into the party constitution, must be recognized and legitimized internally,” said Xia. Xi’s political doctrine, coined “Xi Jinping Thought on Socialism with Chinese Characteristics for a New Era,” was incorporated into the constitution during the 19th National Congress. That put him on the same status as Mao Zedong, as he is the only other CCP leader whose thoughts are enshrined by name in the document while he is still alive. For Deng Xiaoping’s theory, his name was included after his death. Xi also did not choose the destination randomly, as the city is a stronghold of former party leader Jiang Zemin. In the past five years, Xi tried unsuccessfully to take down Jiang loyalists in Shanghai through his anti-corruption campaign. With Li Qiang—a Xi ally—appointed as the new Shanghai Party boss, Xi is showing his support for Li. “It also sends a signal to Jiang’s faction and others about his resolve to [deal with corruption in the city],” said Xia. Li is Han Zheng’s replacement after Han got promoted to the Politburo Standing Committee. Han had a long tenure in Shanghai, as mayor between 2003 and 2012 and then as the city’s party secretary from 2012 to 2017. Li’s appointment signaled Xi’s commitment to tackling the Shanghai Gang, a circle of officials who owe their careers to Jiang’s political patronage.